Let the experience of the Sea Foam tech experts help you with the most common, time-tested recommendations for using SEA FOAM MOTOR TREATMENT in gas and diesel crankcase oil. How much Sea Foam should I add to my crankcase oil? Add 1 to 1.5 ounces of Sea Foam to each quart of crankcase oil for all 4-cycle gasoline, rotary, and diesel engines. Use in all types of conventional and synthetic motor oils. 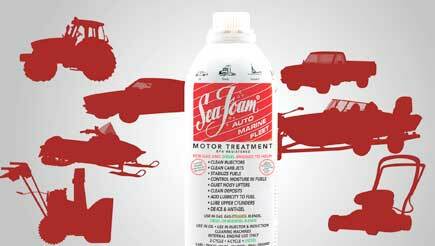 One can of Sea Foam treats up to 16 quarts of motor oil. Most cars and trucks have 5 and 6-quart oil systems: half a can will treat 5 or 6 quarts of oil. Sea Foam only contains petroleum-based ingredients. Unlike some additives, it does NOT include detergents or chemicals that can harm your engine. When should I add Sea Foam to my oil? Sea Foam can be added to your engine oil as often as every oil change interval – just pour into your engine’s oil filler neck! For routine crankcase cleaning, add Sea Foam to your engine’s oil (into the oil filler neck) 100 to 300 drive miles before a scheduled oil and filter change. Check your oil regularly for clarity. Whenever it becomes dirty (goes from clear to dark), change the oil and filter. How will Sea Foam help my engine’s oil crankcase? Sea Foam liquefies petroleum residues that restrict oil flow and engine lubrication. Cleans oil control rings and actuators. Dissolves and cleans deposits throughout the crankcase, including diesel soot residues. A cleaner oil crankcase will add to an engine’s performance and useful life.